It is impossible to understand the development of schools in Victoria County without some knowledge of the evolution of the school system of Ontario as a whole. A brief history of education in Ontario therefore follows as an introduction to the record of our county schools. It may well be pointed out here that the educational system of Ontario is divided into three stages: elementary or Public Schools, secondary schools and universities, each with definite limits and distinct functions. As only elementary and secondary schools have grown up in this county, the history of the universities will be passed over lightly. The past administration of the educational system of Ontario falls into two main periods: a bureaucratic period, from 1823 to 1875, and a period of administration by responsible ministers, from 1876 down to the present. In 1823, a general Board of Education for Upper Canada was established with the Rev. Dr. John Strachan as Chairman. This board was too busy with clerical plotting to accomplish much for the benefit of the province; and ultimately disappeared. On October 18, 1844, Sir Charles Metcalfe appointed the Rev. Egerton Ryerson as Assistant (and later Chief) Superintendent of Education for Upper Canada. An act in 1846 provided for a General Board of Education (consisting of Ryerson and six other members appointed by the governor-general) and a Council of Public Instruction to look after the Normal School. These two bodies were amalgamated in 1850 as the Council of Public Instruction. Ryerson was the real administrator of education in the province until 1875, when he resigned. In the reconstruction of 1876, the Council of Public Instruction was replaced by a Committee of the Executive Council, which really functioned in a Central Committee of Examiners consisting of Professor George Paxton Young of Toronto University (as Chairman), the three High School Inspectors (J.A. McLellan, J.M. Buchan, and S.A. Marling), and four Public School Inspectors (J.C. Glashan, J.J. Tilley, G.W. Ross, and J.L. Hughes). The Central Committee of Examiners was succeeded in 1890 by a “Joint Board” of eight members, half of whom were appointed by the University of Toronto and half by the Department of Education. In 1896, this Joint Board became the Educational Council, consisting of nine university representatives, one High School representative, and one representative of the Public School Inspectors. The Conservative government of 1905 changed this body into an Advisory Council of Education comprising twenty members, who represented all branches of the educational service. In 1906, as the new Minister was a physician and not an educationalist, the old office of Superintendent of Education was revived and John Seath, B.A., then junior High School Inspector, was appointed to the office. Seath was virtual dictator in the Department until his death in 1919. The Advisory Council was abolished in 1915 and no similar body created. No successor to Seath has as yet been appointed. The beginnings of our present elementary school system are to be found in a Parish or Common Schools Act passed in 1816 by the Assembly of Upper Canada. By this Act the people of any village, town, or township might establish a Common School by building a school-house, furnishing at least twenty pupils, and electing three trustees. At the same time a District Board of Education of five members was appointed in each District by the governor for the purpose of superintending the Common Schools, distributing the annual government grant among the teachers, and making an annual report to the governor. There was to be a permanent yearly grant to each District of $1000 for salaries and $600 for books; the balance of the school maintenance had to be made up by local subscription. No advance on this legislation was made for over a quarter of a century. Strachan, who dominated the situation, did not believe in education except for the sons of the Family Compact Anglicans. The school-houses were log shacks without blackboards, maps, or adequate text-books. Salaries were so small that boards often could hire only common idlers, impecunious vagabonds, or disabled and ignorant veterans. In 1841 there were 800 Common Schools in the province, serving about one in eighteen of the population. Not one teacher in ten was fully qualified. There was no efficient supervision and no way of enforcing improvements. Worst of all, few people had any interest in education or any appreciation of its worth. With the union of the provinces in 1841, a great change began. The Municipal Act of that same year supplied local machinery working in harmony with a central government. School Acts were passed in 1841 and 1843, but were poorly drafted and did not work well. In 1844, the Rev. Egerton Ryerson, head of Victoria University, Cobourg, was appointed Superintendent of Education for Upper Canada. After a year of foreign travel and investigation, Ryerson prepared the Common School Act of 1846. His aim was to supply training for the unqualified teachers of the province and then through the leverage of the government grant to compel Districts and school sections to employ qualified teachers, to pay more adequate salaries, to use authorized text-books, and to provide proper buildings and equipment. The Act therefore provided for a Normal School and a Model School, situated in Toronto, at which teachers could secure technical training, and for a Superintendent of Schools in each Municipal District, who should examine every school at least once a year and report on its eligibility for the government grant. The Normal School was opened in 1846 under the principalship of Thomas Jaffray Robertson. Up [until] 1871, teachers’ certificates, valid only in the county where granted, were issued by County Boards of Education. The Normal School began to issue general certificates in 1853. At last, in 1871, it was enacted that only the Normal School could grant first and second class certificates and that all that County Boards could bestow was a three-year third-class certificate to those who had passed a definite Departmental examination. A tremendous change had been brought about. In 1844, Ryerson had found all schools taught by teachers without certificates and without professional training. By 1875, every teacher in the province was certificated under Government examinations and a great many of them had been trained at Normal School. This end had not, however, been attained without many pitched battles with the friends of incompetent teachers and with trustees who wanted cheap teachers regardless of qualifications. Additional Normal Schools have since been established at Ottawa in 1875, at London in 1900, at Hamilton, Stratford, and Peterborough in 1908, and at North Bay in 1909. A system of County Model Schools was set up in 1877 but had practically disappeared by 1907. In 1850, Ryerson passed a second Common School Act, which has often been called “The Charter of the Ontario School System.” This Act permitted the levying of school taxes on all property and not simply on the parents of school-children, as had been done before, and the admission of all children free of charge. This ran sectarian schools practically out of business, for the denominational school, even though partially parasitic on government aid, was unable to compete with the free school. The Act was thus a death-blow to the efforts of busy clergymen to get education into their own hands and to train up the youth of the country in an atmosphere of prejudice. The Act also made Trustee Boards corporate bodies with full power to levy taxes and to manage schools, subject to governmental regulations. By another Act, passed in 1871, the principle of free schools and general taxation for school purposes, made permissible in 1850, became compulsory. As a natural corollary, attendance became compulsory as well, for all children between the age of eight and fourteen. Common Schools were renamed Public Schools. County Inspectors of Public Schools, who had to be qualified teachers with long and successful teaching experience, were appointed. Teachers were to make small payments towards a superannuation fund. This most vital scheme had been set going on an optional basis by Ryerson in 1854. It was abolished by the Mowat government in 1885 and was revived again April 1, 1917. All conscientious teachers are now giving it their full support. During the past fifty years, while no great change has been made in the administration of the Public School System, many changes have been gradually worked into the curriculum. Kindergartens were begun in 1882 and officially recognized by 1885. Since 1914, this work has received fresh impetus with the formation of a new Public School department, know as the Kindergarten Primary. 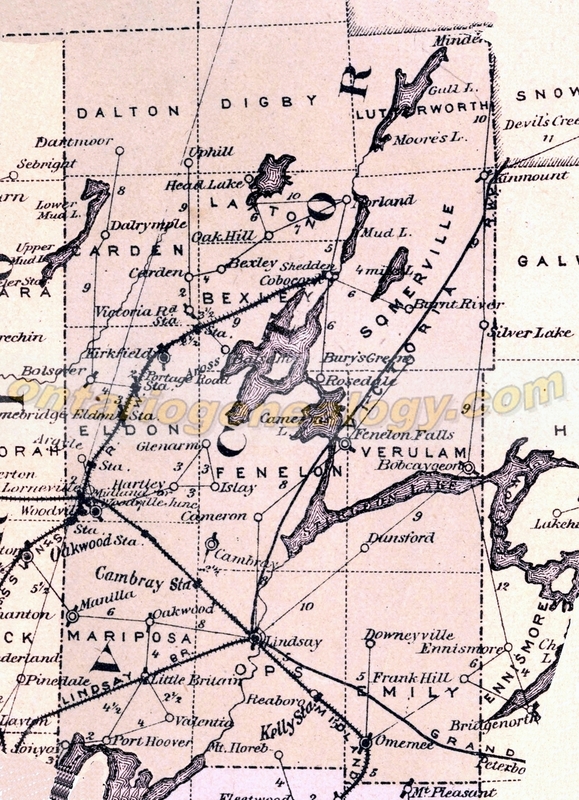 The study of Agriculture was mooted as early as 1871 but nothing effective was done until 1907 when a system was worked out whereby graduates of the Ontario Agricultural College were appointed as County Agricultural Representatives and included school instruction in agriculture among their duties. In 1918 such instruction was being carried on in 1020 Public and Separate Schools. Domestic Science for girls and Manual Training for boys was introduced in 1900, the former by a Mrs. Hoodless and the later by Wm. McDonald of Montreal, assisted by A. H. Leake. In 1918 Domestic Science was being taught in 85 centres and Manual Training in 93 centres. A system of Continuation classes was originated in 1896, whereby pupils could receive, while still in Public School, advanced instruction similar to that of junior High School classes. In 1918 there were 137 of these Continuation Classes, with an enrollment of 5104 pupils. The antecendants of our High School system go farther back into the past than do those of our elementary schools. In 1798, some 549,217 acres of land were set aside to support free Grammar Schools and a University. An Act passed in 1807, made an annual grant of ?100 to one Grammar School in each of the eight municipal Districts then established. These Grammar Schools were supposed to be classical seminaries after the model of the great English Public Schools. In practice, they were taught and controlled by Anglican clergymen and reserved for the children of the Family Compact oligarchy. So incompetent did these schools become that in 1829 a Select Committee on Education, appointed by the Assembly, recommended their abolition. They were, however, maintained by the influence of the Compact; and in 1830 their revenue and management was placed under the Council of King’s College, an Anglican university whose charter had been secured in 1828 by Dr. Strachan. No control of Grammar Schools was given Ryerson on his appointment as Superintendent in 1844. He succeeded, however, in having investigation made. It was found that in 1849 forty Grammar Schools had only eight matriculants altogether. Most of them were doing Common School work and doing it poorly. A Grammar School Act which became law on January 1, 1854, made secondary schools part of the provincial system. Grammar School Trustee Boards, with power to levy rates, were to be appointed by County Councils. Legislative grants, though generous, were to be made only when balanced by local taxation. Strict supervision was to be conducted by Grammar School Inspectors appointed by the Council of Public Instruction. Four years later, Ryerson founded a Model Grammar School at Toronto for the professional training of Grammar School teachers. This school was closed in 1863 and all such instruction given in the Normal Schools until 1865, when Training Institutes were set up in connection with the Collegiate Institutes at Hamilton and Kingston. In 1891, the Training Institutes were replaced by the Ontario School of Pedagogy, established at Toronto, with James A. McLellan as principal. In 1896, this was affiliated with Hamilton Collegiate Institute as the Ontario Normal College. In 1907, Faculties of Education at Toronto University and Queen’s University took up the work. And in 1920, these Faculties of Education were centralized at Toronto as the Ontario College of Education. Ryerson drafted a second Grammar School Act in 1865. It was now necessary for headmasters of Grammar Schools to be graduates of universities in the British dominions. Half the Grammar School trustees were to be appointed by the council of the town or village where the school was situated. And the government grant was based on the number of pupils studying Latin or Greek. As a result, almost all the students in each locality, boys and girls, fit and unfit, were thrust into the Grammar School and set at Latin so as to secure a large government grant. The result was widespread demoralization of the school system. George Paxton Young, one of the Grammar School Inspectors, diagnosed the case and prescribed the remedy in a High Schools Act which was passed in 1871. By this Act, the term “Grammar School” was abolished and the name “High School” (borrowed from the United States) was substituted. The classical obsessions of the past were disregarded and provision made for training in advanced English, natural science, and commercial subjects. Languages became optional only. A departmental examination was also prescribed for all seeking admittance to the High Schools. This examination, which still persists, was superlatively sensible in that it shut out all unfit pupils and gave the High Schools a distinct status in the educational system. Considerable agitation against the Entrance examinations has been carried on in recent years but such efforts have been confined to doctrinaires, politicians, incompetent Public School teachers, and the zealous parents of stupid or lazy children. In cities like Toronto, where Public School staffs are comparatively permanent and inspection is incessant, promotion to High Schools on teachers’ recommendations in perhaps feasible; but outside of urban centres, the abolition of the Entrance Examination would soon demoralize our secondary schools. The Act of 1871 also made provision for a superior class of High School, to be known as “Collegiate Institutes.” The chief differences from High Schools lay in a higher standard of equipment and in “specialist” qualifications for teachers at the head of departments. During the fifty years which followed, the outstanding phenomenon in secondary education in Ontario was the way in which the Universities and Normal Schools dominated and encroached upon the High Schools. The earliest universities in the province were King’s College (chartered 1828), Queen’s College (chartered 1839), and Victoria College (chartered 1841). Many other colleges followed in the course of time, but all except three (Queen’s, McMaster, and Western) have been affiliated with Toronto University under a federation scheme worked out in 1887. For half a century, the courses of study in our High Schools have been almost wholly determined by the requirements laid down by the universities for matriculation into courses towards the professions and by the departmental requirements for entrance into Normal Schools and the teaching profession. No provision was made to meet the real needs of the great number of students who did not go beyond High School. For girls especially, the usual consummation of whose career is homemaking and not the sterility of a profession, such a system was almost criminal in its insistence on useless subjects and its omission of training for domesticity. Another weakness is provincial education was the way in which a bureaucratic Education Department, in its passion for uniformity regardless of local needs, keep promulgating an everlasting series of elaborately detailed syllabi for the guidance of teachers of all grades down to the most obvious and trivial detail. The Department was apparently loath to credit any teacher with the administrative intelligence of an anthropoid ape. A transformation was foreshadowed by the appointment in 1920 of a representative Committee to examine the secondary school system of Ontario and report on necessary or desirable changes in organization. The report of this Committee is to take effect in September 1921, and will inaugurate many drastic changes. The secondary schools will now provide a five-year course, consisting of a Lower School course of two years, a Middle School course of two years, and an Upper School course of one year. The study of English is compulsory throughout every year and the study of Canadian History and Civics, Physiography, Algebra, and Geometry each obligatory in the Lower School for one year only. All other subjects are optional, but at least three and not more than five are to be taken each year. Options are to be decided by the Principal and not by the student. Provision is made for the study of Agriculture, Household Science, Manual Training, or indeed any subject whatsoever which the Principal and School Board may decide is desirable in the locality. Pupils who do not wish to go beyond the High School may secure a Graduation Diploma by passing on 12 subjects, at least 6 of which are in the Middle School. In all examinations, pupils will be credited with every paper on which they obtain 50%. The changes in the system are far-reaching and will require at least two years for proper assimilation by our schools. Further drastic changes affecting both Public and High Schools will be made by a recent Adolescent School Attendance Act, which is supposed to take effect this September, more particularly in urban centres. This measure is modeled after the Fisher Bill in England and provides that every adolescent between 14 and 16 years of age, with certain qualified exceptions, must attend school full time each year. Moreover, those between 16 and 18 who have not put in full time up to the age of 16 must take part-time instruction of at least 320 hours each year. It will be vital, in the operation of this scheme, that such extra training shall be preparation for practical life and not a mere grind in an academic treadmill. Special provision must also be made for the very bright child and the very dull child. In most Public Schools at the present day, a downright crime is being committed against very intelligent children by holding them back to the pace of the average child and keeping them for the full term in each of an unreasonable number of class subdivisions. On the other hand, most backward students have actual physical or mental defects or deficiencies and require individual examination and special instruction. Public libraries and industrial training are also integral parts of Ontario’s educational system. As early as 1835, we find the government giving grants to Mechanic’s Institutes at Toronto and Kingston. These Institutes aimed at providing class instruction adapted to the wants and circumstances of workingmen and at furnishing a reading room as supplementary to such instruction. In 1851, An Act was passed for the better management of Mechanics’ Institutes and Library Associations, and in 1857, a Board of Arts and Manufacturers was incorporated to promote their growth. In 1868, after Confederation, the Board of Arts and Manufacturers was abolished	and the Mechanics’ Institutes under the Department of the Commissioner of Agriculture for Ontario. Provision was made in 1873 for a semi-annual inspection of Mechanics’ Institutes by County School Inspectors; and in 1880 they were placed under the Ministry of Education and incorporated into the provincial educational system. A Free Libraries Act, passed in 1882, then permitted Mechanics’ Institutes to become free libraries, [Con’t. p.7] supported by a maximum tax of half a mill levied on the municipality; and in 1895 the official name was changed to “Public Library.” Great financial assistance was given to most of the provincial libraries by the late Andrew Carnegie the Scotch-American millionaire. Supervisory control, however, has remained vested in the Education Department. An important revision of the Public Libraries Act in 1920 granted libraries the support of a municipal per capita tax of fifty cents. The industrial class instruction of the old Mechanics’ Institutes has largely disappeared from the modern Public Library and has been otherwise provided for. In 1909 a Technical and Art School was opened at Hamilton and in 1910 a large Technical High School began operations in Toronto. In the following year the Minister of Education established a sub-department known as the Department of Industrial and Technical Education, with Dr. F.W. Merchant as Director. Great progress has since been made and in 1920 there were 12 industrial day schools with 177 teachers and 4790 pupils and 49 industrial night schools with 845 teachers and 26,527 pupils. Only a few primitive schools grew up in Victoria county in the ill-regulated period prior to Ryerson’s appointment as Provincial Superintendent of schools. In Emily, the first school was at Omenee. James Laidley and Captain Matthew Handcock were early teachers. The first school in Ops was the modern school-section No.9, long known as the “McNeely school.” The first teacher here was Wm. P. McGrane, who came in from Cavan township in 1835. He taught at first in his own log home and then in a log school on the farm of Charles Corneil. The “Walker school,” at the junction of the Mt. Horeb and Omenee roads, was also very early. The teacher here was Thomas Kent. In Mariposa, the first schools were at Oakwood and at Taylor’s Corners. In Eldon, the first teachers were Angus Ray, in a house on the Thorah side of the town-line, Lachlan Campbell, on Concession III, and John Groogan, on Concession VI. The first school in Verulam was taught by John Taylor in a log cabin on Babcaygeon Island. Under the Common School Act of 1843, Rev. Elias Burnham of Peterborough was appointed Superintendent of Schools for the Colborne District, a position which he held till 1850. His salary was at first £25 per annum, and was later raised to £50, a sum which was supposed to cover traveling expenses which far exceeded his stipend. Had he not possessed private means, he could never have carried on, as he did, at a dead loss for seven years of unremitting toil. His report for 1844 records a great deficiency of school-books, due to the poverty or indifference of parents. A fair number of children could read and write, but neither grammar nor history was taught and geography was rare. Benson, whose son was later Judge Benson, of Port Hope, was one of the outstanding Canadians of his generation. He was killed in the great railroad disaster at the Desjardines Canal in 1857. After his retirement in 1852, a system of Local or Township Superintendents was set up. By 1857, nine men (five in Victoria county and four in Peterborough) were carrying out the duties which he had borne alone. In 1857, Local Superintendents in Victoria were as follows :---Rev. Wm. Briden, Omenee, supervising Emily, with 14 schools; A. Lacourse, Lindsay, supervising Ops, with 10 schools; W.H. McLauchlin, Oakwood, supervising Mariposa, with 20 schools; Peter H. Clark, M.D., Woodville, supervising Eldon, with 6 schools; Rev. Daniel Wright, Fenelon Falls, supervising Fenelon, Verulam, Somerville and Bexley, with 10 schools. Some 4022 children were attending school, of whom 2177 were boys and 1845 girls. Of the 47 schoolhouses, 35 were log, 11 frame and 1 brick. Some 39 schools were free, and 16 partly free. All the teachers held qualifying certificates. The [Con’t. p. 9] average length of the school term was 11 months, 26 days. There had been 422 visits made during the year, chiefly by trustees and clergymen. No common school in the county was teaching Canadian history, but 12 were giving instruction in algebra and 7 in geometry. In Lindsay, the first school had been begun about 1841 in a frame building which still stands at 23 Wellington Street. It was used as a school during the week and as a Methodist church on Sundays. In 1852 a [frame] school was built on the northwest corner of Kent and Albert streets. Four years later, Roman Catholic Separate School classes were begun by John O’Donnell in the log church on the southwest corner of Lindsay and Russell streets. The attendance in 1857 was 114 and the teacher’s salary £100. O’Donnell’s immediate successors were Michael O’Neill, (1858-60), John Murray (1860-61), John O’Brien 1861-62, and John Sweeney (1862-64). In 1868, the present white brick building was erected on the same lot as the log church. At the present day, there is a staff of three teachers with a registration of 154 boys. Roman Catholic girls to the number of 160 are given instruction in St. Joseph’s Academy, Lindsay. In the county as a whole, the School Act of 1871 established two inspectorates, East Victoria and West Victoria. The inspectors then appointed were J.H. Knight and Henry Reazin respectively. Their successors in more recent times have been G.E. Broderick and W.H. Stevens, B.A., respectively. In 1877, there were 135 schools in the county, of which 53 were brick, 41 frame and 41 log structures. In 1920, there were only 103 rural schools but 74 were brick, 4 stone, 25 frame, and none of logs. The total value of rural school property and equipment in 1920 was $460,317.00; and the total expenditure on education for the year was $216,604.81. The number of school-children has, however, decreased rapidly. In the rural Inspectorate of West Victoria, during the past 37 years, while the number of householders has increased by 492, the number of children of school age has dropped form 6593 to 2479. The cause is obviously not migration to urban centres, but the voluntary limitation of families. As a result, many schools once prosperous are now almost deserted. There are five schools in West Victoria whose average total attendance is only 20 pupils, or 4 pupils to each teacher employed. Attempts have been made to improve the situation by “consolidating” school sections adjacent to Manila and Woodville, but the movement has been defeated by the opposition of childless ratepayers. The consolidated school is, however, a makeshift and not a remedy, and would itself ultimately stand empty under continuous race suicide. The first instruction in agriculture in this county was given in 1907 in connection with the Lindsay Collegiate Institute by Francis H. Reed, B.S.A., then newly appointed as County Agricultural Representative. The present representative, Mr. A.A. Knight, has been holding courses in agriculture in connection with the Farmers’ Clubs. He has also organized very successful school fairs in connection with the rural schools. In 1920, school fairs were held at Bobcaygeon, Burnt River, Cambray, Dalrymple, Downeyville, Dunsford, Fenelon Falls, Kirkfield, Little Britain, Oakwood, Omemee, Reaboro, and Woodville. In all, there were 2675 children and 1750 adults at these fairs. Entries of cooking, poultry, flowers, fruits, grains, and vegetables totaled 3779. Competitive garden plots, planted and tended by the children, exceeded 2000 in number. These fairs excite great interest and are undoubtedly a very effective form of instruction. No secondary schools appeared in this county until after the Grammar School Act of 1853. The Lindsay Grammar School was then established in 1854, the Omemee Grammar School in 1858, and the Oakwood Grammar School in 1859. It may be convenient to treat of these schools in the reverse order. The first teacher of the Oakwood Grammar School was George Murray, a B.A. of Oxford University, who was later known as one of Canada’s most distinguished classicists. The school was at first build and maintained by the school section alone, but later obtained support from the township of Mariposa. It had a long career of exemplary usefulness and turned out hundreds of successful graduates such as Dr. Wylie, M.P.P., George Thomas, Dr. Broad, Dr. Whiteside, J.L. Whiteside, H.J. Lytle, Judge Dean, Judge McIntyre, Rev. Thomas Brown, Rev. J. Hubbell, Rev. C.V. Lake, Rev. Isaac Weldon, Rev. S.J. Cunnings, Donald Anderson, Frederick Shaver, and many others. So important was Oakwood as a school centre that in 1887 some 45 students passed the Entrance there to 29 at Lindsay. In 1888, an unedifying feud arose between the School Board and the Township Council, and the school was ultimately assassinated as a piece of municipal politics. An attempt was made to organize another school at Manilla but the project did not survive. The Omemee Grammar School was begun in 1858 in conjunction with the Common School. The principal for nearly a quarter of a century was John Shaw, M.A. Perhaps the most distinguished [Con’t.] graduate of the school has been “Formosa” McKay, the famous missionary. The school buildings were destroyed by fire on November 18, 1884, and again on January 28, 1904, but were rebuilt. Of recent years, the registration of pupils has stood at about 40. The first Grammar School at Lindsay was established in 1854. When the first attempt to sketch the history of the school was made in 1899, it was found that incomplete minutes of the Board of Education, dating back to 1857, indicated that the Grammar School had been in existence at least as early as 1855. The present author has since discovered, by research in the Dominion Archives, that a legislative grant of £100 was made to the Lindsay Grammar School in 1854. Classes were held in the Common School building, a small frame structure on the corner of Albert and Kent streets. The sole teacher was William Daunt, whose wife had charge of all the Common School classes. The total population of the village did not exceed 500 at this time. On February 5, 1863, a new Union School building of red brick, farther west in the same block, was opened. This edifice, which was torn down in July 1921, was a mock mediaeval hybrid of monastery and barracks, with the air of a shoddy castle badly run to seed. Robert Hudspeth had become master of the grammar School in 1861, while Francis Whalley and Jos. A.Clark had taken over the Common School classes. Hudspeth was succeeded in 1866 by the Rev. A. Murray, then but recently arrived from Scotland; and the latter in 1876 by Henry Reazin. Reazin retired at the close of 1870 to become Public School Inspector for West Victoria. Alfred M. Lafferty, M.A., then became principal. As the headmaster of the High School was then also head of Public Schools, Lafferty asked for an assistant, and, on meeting with a refusal, resigned. His successor from 1872 to 1879 was Robert L. Dobson. The following list of successful Entrance candidates from 1872 to 1876 may be of interest: ---1872, R.G. Cornell, John Woods, Charles Reeves, Robert McDougall, George Patrick, James C. Grace, William Johnson; 1873, George Bigelow, Jas. M. Knowlson, John Baxter, John McIntyre, J.C. Whyte, James Watson; 1874, A. Bryson, Wm. Fee, Hugh McLachlan, W.D. Best; 1875, Alex. Morrison, R.J. McLennan, T. Nugent, Alex. Skinner, E.C. Young, N. McMurchy, George Powles, S.J. Mason; 1876, A. Freeman, T. Macaulay, W.A. McLennan, R.M. Spier, Jas. Curtin, S. Malone. In 1876, Thomas C. Patrick, the first matriculant of the school, passed into law school. By 1885, the number of matriculants had risen to 4; and there was an average of 6 for the three years 1904-06. In 1920, the school passed 34 pass matriculants, and 14 honor matriculants, in addition to securing 40 second class certificates and 7 first class certificates. Another promising record was that of 1915 when there were 22 first-class certificates. 36 second class certificates, 49 third class certificates, 5 honor matriculants, and 24 pass matriculants. The school has also had a gratifying scholarship record, as follows: ---1880, Roderick McLennan, Queen’s scholarship in mathematics; 1881, B.S.Vanstone, third general proficiency scholarship, Toronto; 1885, W.H. Mills, Registrar scholarship, Queen’s; 1886, Fred R. Heap, classical scholarship, Queen’s; 1893, Jessie Brown, two Toronto scholarships in classics and general proficiency; 1897, E.J. Kylie, classical scholarship, Toronto; 1898, Mary McDonald, proficiency scholarship; 1901, F.A. Jackson, scholarship in Latin , French and German; 1901, W.C. Way, scholarship in mathematics, Queen’s; 1910, Henry Philp, scholarship in mathematics, Queen’s; 1910, Dorothy French, four different Toronto scholarships in Classics and Moderns; 1911, Leigh Cruess, scholarship in Mathematics, Queen’s; 1913, J.M. Clark, scholarship in Mathematics, Physics and Chemistry; 1913, George Hardy, first Edward Blake scholarship in Classics and Mathematics, Toronto, 1913; Watson Kirkconnell, six different Queen’s scholarships in Mathematics, English and History, Moderns, and general proficiency. The attendance rose from 62 in 1877 to 186 in 1881; then dropped to 115 in 1885; and has since risen steadily to 207 in 1907 and to 344 in 1920. The number of teachers has grown from 4 in 1822 to 7 in 1908 and to 11 in 1921. In 1880, W.E. Tilley, M.A., became principal. He was succeeded in 1884 by Wm. O’Connor, B.A., and the latter in 1887 by J.C. Harstone, B.A. Mr. Harstone continued as principal until 1908. Associated with him during his incumbency were Messrs. R.H. Walker, F.F. McPherson, John Head, E.A. Hardy, J.C. Corkery, J.H. Colling, Geo. H. Cornish, W.H. Stevens, J.S. McLean, Luther Taylor, and Chas. P. Muckle, and Misses Addison, Staples, Eliza Fitzgerald, Sophia Marty, Alice Wilson, and Julia Hillock. In 1888, a new school building was completed on the corner of Kent and Adelaide streets. This was a three-storey structure of red brick on a foundation of white Bobcaygeon stone, 74 feet square. Its accommodation included 7 class-rooms, an Assembly Hall, 40 feet by 72 1-2 feet, planned to seat 700, and a stage 30 feet by 25 feet. The architect was Wm. Duffus, and the contractors Messrs. McNeely and Walters. The total cost was $27,000. The new school was formally opened on January 22, 1889, by the Hon. G.W. Ross, then Minister of Education. It was now raised from the status of High School to that of Collegiate Institute. A cadet corps, later registered with the Militia Department as No. 44, was organized December 23, 1898, under the stimulus of the approaching Boer War. The corps originally comprised only a limited number of the senior boys but was reorganized in 1910 as a cadet battalion, including every boy in the school. During the World War of 1914-18, some 264 ex-members of the corps served in the Canadian Expeditionary Force and 26 gave up their lives in the cause. On December 29, 1898, a great Alumni Re-union and Conversazion was held; and in 1905 a semi-centennial celebration was staged. In 1908, T.A. Kirkconnell, B.A., the present principal, assumed control. His associates since that time have been as follows: --- Science: Howard Rosevear, D.A. McKay, Thos. Firth; English: J.F. Macdonald, J. Newman, E.W. Jennings; Classics: J.A. Freeman, R.A. Croskery, E.A. Miller, Chas. Owens, Arthur Hooper, Walter Clark, P.K. Hambly; Moderns: Miss Allen, Miss Teskay, Miss M.I. Whyte, Miss Gibson, Miss Bristol, Mrs. Cameron, Miss M. Montgomery; History: Gordon Manning, Albert O’Neill, M. Erb, A. Johnston; junior work: L. Wheelton, M. Rogers, R.A.A. McConnell, F.H. Bissonette, J.S. Crerar, G.S. Mattice, R. Kerfoot, M. Brokenshire, F.H. Barlow, Miss K, Moir, Miss D. Morley, Miss Vanalstyne, Miss Corkery, Miss Shook, Miss E. Davis; Commerce: G.A. Robertson, G.A. Lucas. The growth of school population made necessary the building of a new wing, consisting of four class-rooms, two private rooms for principal and male teachers respectively, and a gymnasium 80 feet long by 40 feet wide. This addition to the school was opened March 1, 1910, by President Robert Falconer of Toronto University. In 1921, accommodation has again become painfully inadequate. The chairmen of the Board of Education of Lindsay for the past 64 years have been as follows :--- 1857, Rev. J. Hickie; 1858, G.M. Roche, Esq. ; 1859-65, Rev. J. Vicars, B.A. ; 1866-67, J. Fidler, M.D. ; 1868, Hon. S.C. Wood; 1869, 1871-72, 1874-75, John McLennan, M.A. ; 1870, Adam Hudspeth, Esq. ; 1873, Lawrence Maguire Esq. ; 1876-85, Wm. Grace, Esq. ; 1886-90, Adam Hudspeth, Q.C., M.P. ; 1890, Hon. John Dobson; 1891-99, J.R. McNeillie, Esq. ; 1900-12. Thomas Stewart, Esq. ; 1913-15, J.D. Flavelle, Esq. ; 1915-17, Alex. Jackson, Esq. ; 1917-21, John W. Anderson, Esq. A magazine reading-room was founded in Lindsay in May 1860; and was supported by an annual fee of six dollars from each 130 of the leading citizens. It was located next to Thomas Beall’s store in the present Dundas and Flavelle block. On January 10, 1880, it was reorganized as a Mechanics’ Institute, under the librarianship of H.A. Wallis, over Dobson’s store, on the southeast corner of Kent and William streets. In 1884, drawing classes were held by A. Reading, a graduate of the Ontario School of Art. The Institute was opened as a Free Public Library March 23, 1899. Negotiations with Andrew Carnegie were entered into in 1902 with a view to financing the construction of a library building, and $13,500 was secured on the town’s guarantee of a minimum annual grant of $1350 for maintenance. A red brick structure in modern Greek style was opened to the public July 5, 1904. In 1920, the shelves contained 7901 volumes; the legislative grant was $251.45; and $2145.31 was spent on books and salaries. There are also free public libraries at Little Britain and Oakwood, with 3026 and 2177 volumes respectively; and association libraries at Manilla with 5068 volumes, at Fenelon Falls with 4837 volumes, at Bobcaygeon with 3406 volumes, at Kirkfield with 2513 volumes, at Cambray with 2330 volumes, at Omemee with 1716 volumes, and at Kinmount with 1617 volumes. In the autumn of 1919, an Industrial and Technical School was organized in Lindsay under the direction of T.A. Kirkconnell, B.A., L.L.D., Principal of the Collegiate Institute. There was a registration of 380 pupils, to whom instruction was given by a staff of 14 teachers. The only fee was $2.00, refundable in all cases where 75% attendance had been made. All classes were held in the evening, in the Central public school building. Tuition was given in Shop Mechanics, Drafting for Woodworkers and Ironworkers, English, Commercial Subjects, the Railroad Airbrake, and Sewing and Dress-making. The term lasted from November 1, 1919, to March 31, 1920. Interest was sustained until the end. The most gratifying feature of the work was that the pupils registered were in the great majority of cases precisely those persons, (clerks, artisans, mechanics, housekeepers, etc.,) who might be expected to reap immediate benefit. In November, 1920, the Night School was reopened under the principalship of Thomas Firth, M.A. Th[e] subjects of Motor Mechanics, Millinery, and Home Nursing were now added to the curriculum. The future possibilities of the school, as an institution for the continual education of the adult community, are very great indeed. Present Needs of our Schools. In spite, however, of all the development of Victoria county’s schools, as already sketched, and in spite of heavy expenditure in the past and the present, our school system is still far from perfect. Perhaps the most pressing need of the times is a proper medical inspection of all school children. The system began in Belgium in [Con’t. ]1874; has since been adopted in France, Germany, Austria, England, Japan, many of the United States, British Columbia, Manitoba, Saskatchewan and Alberta; and only found favor in the supposedly enlightened province of Ontario in 1919. The Department of Education then began to urge its adoption and to assist in conducting medical surveys. In one case, out of 2303 children examined, fewer than 100 were found to be without defects, and of the great number of defectives about 85% were curable by the simplest kind of a surgical operation. If the defects were not remedied, the children would in [some] cases be condemned to lives of comparative uselessness; while in all cases their powers would be impaired, their progress retarded, and the seeds of incurable disease perhaps planted. Another survey conducted this year in three townships in Lambton county found that out of 1286 pupils examined 92% were defective. Such instances could be multiplied by reference to other surveys. Victoria county still remains in heathen darkness in this matter. In November, 1920, the local Women’s Institute sought to stir the school authorities up to action. The movement has, however, been blocked, apparently through the hostility of the doctors, who should be the most enlightened sponsors of the project but who are perhaps unable to agree to co-operate because of incompatability of professional temperament. It is to be hoped that the Women’s Institute will refuse to accept defeat, for the need is urgent and neglect is a menace to the community. Another necessary measure, affecting only the outside students in attendance at the Collegiate Institute, is the ensuring of proper lodging and guardianship. A residence or hostel for the girls, run at cost and headed by a respectable matron, is very desirable, for protection is needed today from a pack of wolves whom the pioneers knew not of. Boarding-houses, too, should be supervised, not officiously but maternally and with only the students’ interests at heart. In the larger public schools, we shall soon hope to see applied a new method of grading children according to intellectual capacity. A school of modern psychologists, beginning with Alfred Binet, a Frenchman, in 1904, has worked out a remarkable system for measuring intelligence, or the capacity of the mind, rather than the actual knowledge accumulated through study. The tests employed demonstrate the vast difference in intelligence which all teachers know exist between one child and another, and solve most problems associated with retarded or precocious children by enabling the teacher to assign them tasks commensurate with their actual ability. The actuality of the results obtained have been vindicated for all time by wholesale experiments on the American Army, and the time is not far distant when our Ontario school system will recognize, measure, and accommodate the individual differences in intelligence between child and child. Manual training for boys, more particularly in the town schools, is much needed. The aim of education is not the accumulation of stores of miscellaneous information, which the adult gets from encyclopedias, dictionaries, and other works of reference, but the training of the mind to deal with life’s problems when maturity is reached. The development, through intricate training, of a great variety of muscles, especially those of the hand, brings corresponding growth to the brain centres by which they are controlled. The country boy, through his use of many implements and tools, has thus an immense advantage in actual brain development over the modern town boy. The only practical remedy for this deficiency in the life of the town boy is to supply classes in manual training. This need not be detrimental to efficient training in the three R’s. It has been conclusively demonstrated by modern psychologists that in each subject there is a time limit within which the best results are secured and beyond which instruction is non-productive. For example, half-an-hour a day on arithmetic and ten minutes on spelling have been found to give as good results with Public School pupils as an hour and a half on arithmetic and forty minutes on spelling. Obviously, ample time can be spared for manual training. For girls, training in domestic science cannot be too strongly advocated. Our school system has been planned for boys and no provision has been made for girls. From the time that little girls of six or seven begin their primary work in the public schools from their day of graduation from a university, no class of any kind, is, as a rule, provided that has any bearing on their ultimate paramount duty of home-making. Domestic science is a crying need in our Victoria county schools, and government grants are so generous that the municipal cost would be insignificant. The relationship of girls to higher education is an advanced form of this problem. Statisticians have secured data as to the families of all graduates from a number of leading women’s colleges during the period 1850-1890. It has been found that the average graduate is represented in the next generation by 0.86 of a child. For every 5 possible mothers, there are only 2 daughters. In a century, every 100 of such women would be represented by 4 sickly great-granddaughters. If the entire population of Canada were to perpetuate itself at such a rate, it could, in three centuries, be housed comfortably in Fenelon Falls or Bobcaygeon. Something must be radically wrong with an educational system which has such appalling effects on womanhood. The scientific explanation is that	the stress of advanced studies burns up in brain activities the energy which would normally go toward the maturing of the natural functions; and so virtual sterility is brought about. But a still wider accusation touches the wrong perspective of life which is given the higher student. She either strains over heavy male courses, designed to fit her for an independent position in a male civilization, or else toys with easy trivialities. All too often, as a result, the essentials of existence are lost to her; her instincts are prevented from reaching normal maturity; she comes to regard motherhood as a clog on a wheel of intellectual interests or social indulgences; and all thought of racial responsibility and of racial morality is deadened. Our system of feminine higher education needs a drastic recasting before it will cease to be a menace to womanhood and to the race.